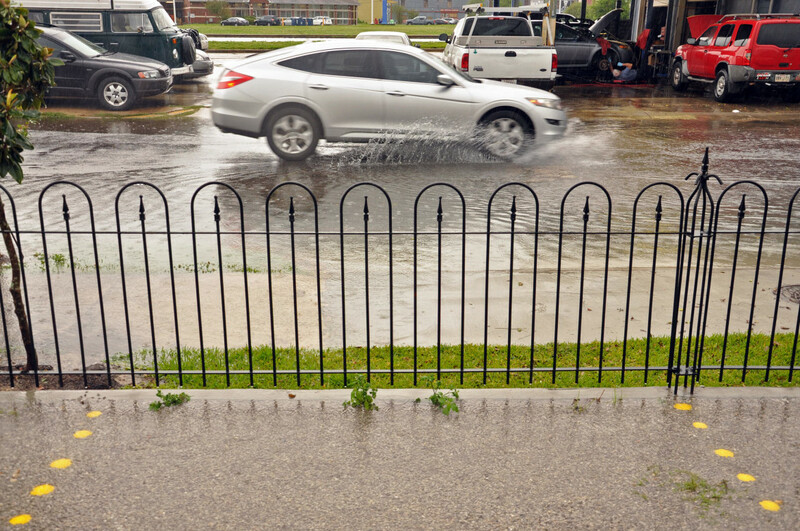 The parking lot at Parkway Bakery and Tavern stays dry as the nearby street takes on water in a recent storm. The thunderstorm had flooded Hagan Street so deeply that passing cars were pushing wakes onto the sidewalk next to Parkway Bakery and Tavern. But owner Jay Nix wasn’t upset. It just provided another opportunity to brag about the 100-car, rain-absorbing, parking lot he installed last year. It was dry. Nix is not an official spokesman for city officials’ new stormwater management efforts, but they probably can’t find a better one. Among its major goals is reducing flooding caused when drainage pumps are overloaded during the torrential rainstorms common in this subtropical environment. The best way to do that is by slowing the speed at which rainwater enters the system, and there are two major tools to achieve that. One is temporarily storing rainwater on the surface with landscape features such as rain gardens and swales. The parking lane on Deslonde Street was paved with a solid but porous concrete mixture. The city said results indicate the practice should be used throughout the city where affordable. The second is reducing the amount of rain-shedding material such as concrete and asphalt covering the landscape and replacing them with pervious products – those that let water seep through. Both strategies also give rains a chance to recharge ground water levels, helping reduce the subsidence problem that plagues streets and buildings. The city affirmed the importance of this strategy in the 2015 Comprehensive Zoning Ordinance requiring new buildings of 5,000 square feet or larger to have a city-approved groundwater management plan. Pervious, or porous, surfaces come in a variety of forms. Rigid paving sections produced from stone or concrete with small pores are used in high traffic areas such as street and parking lots. Rain can also seep through the channels between the pavers. A process called “pervious concrete” is a mixture of small limestone chips bound by concrete that leaves large enough gaps for water to easily pour through. It is usually used for low traffic areas such as sidewalks but also parking lots. The largest concentration of pervious coverings is in a demonstration project in the Make it Right Foundation section of the Lower 9th Ward. The parking lane on the west side of Deslonde Street, from North Derbigny to North Prieur streets, as well as shorter sections of some side streets, were rebuilt with a smooth-surfaced special blend of porous concrete. More noticeable are new sidewalks and driveways made with pervious concrete. City spokesman Hayne Rainey said that effort was a $2.7 million special project to test the effectiveness of pervious coverings. It involved removing solid coverings and rebuilding subsurface utilities. Funding came from a federal Community Development Block Grant and the Make It Right Foundation. He said the cost was about 20 percent higher than traditional concrete. And some of the rigid, permeable material used for high-traffic areas such as streets and parking lots will require periodic scrubbing and power vacuuming to remedy clogged pores. However, the results “show the material can and should be used in future DPW projects, when the project scope and budget allow,” he said. 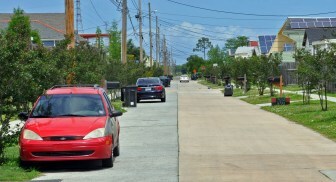 The initial higher costs of permeable materials are offset by long-term savings, said David Lessinger, director of planning and strategy at New Orleans Redevelopment Authority. The ability of pervious coverings to reduce the need to vastly expand the underground drainage system is a case in point, he said. “The cost to upsize our entire system to handle, say, a 100-year event, would be in the billions, but we can increase our resilience at a much lower cost,” he said. Civic groups supporting the green changes say the new zoning ordinance has increased what was already growing community support for the ideas, and Brent Magee, owner of Mandala Concrete in Mandeville, said his business is proof of that. His company has done all the work in the Make It Right area and an 82,000-square-foot parking lot at Xavier University*, and is preparing to put down a 200,000-square-foot lot at the new University Medical Center. “There is growing interest from professionals who want to understand the ramifications of the stormwater management requirements in the community zoning ordinance,” said Dana Eness, of the Urban Conservancy. She said a full house of 40 contractors showed up for a six-hour continuing education course on the subject, and 150 people attended a demonstration project on working with TRUEGRID – the system Nix used for the parking lot at Parkway Bakery. It doesn’t use solid pervious pavers or paving material. Instead, it employs a network of interlocking plastic circles that are then filled with BB-sized pieces of rock or concrete. The grid holds them in place, providing a solid, even surface that is highly porous. Nix said the whole project costs about $5 per square foot, roughly $2 per square foot cheaper than concrete or asphalt would have been. But he was attracted as much by the environmental advantages as the price. Some of the toxins in stormwater are removed during its journey through the landscape. “All those cars in a parking lot are dripping oil and other toxic stuff onto concrete or asphalt, where it sits until the rain comes and washes it into the drainage system,” he said. “And then, all that goes out into our lake. *Correction: A previous version of the story said the Xavier lot was planned. In fact, it is complete.